Soy milk is a lactose-free, vegan alternative to milk; it is often used by people who have an allergy or intolerance for dairy. Soy milk has lower calcium and vitamin B content but is richer in iron compared with cow's milk. A cup of cow’s milk contains lactose (a sugar found only in milk), 8.03 grams of protein and 11.49 grams of carbohydrates and 8 grams of fat. It also contains 28% of an adult’s daily calcium and 50% of needed riboflavin and cyanocobalamin. In comparison, soy milk contains no lactose, half the fat (4.7 grams), slightly more protein (10.98 grams) and significantly less carbohydrates (12.8 grams) per cup. Soy milk naturally contains much less (almost no) calcium and vitamin B, but some manufacturers fortify it with extra calcium and vitamin B for nutrition. Natural milk contains a specific sugar called lactose, found only in milk. Lactose can be hard to digest by some people if they lack the required digestive enzyme lactase, and will not be able to digest milk easily. Soy milk is mostly used as an alternative to milk by people with lactose intolerance, since it is completely lactose-free. In fact, it has even less (i.e. 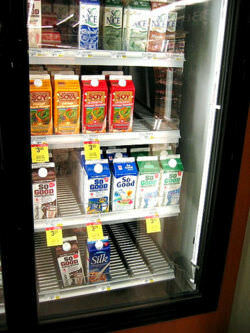 zero) lactose than "lactose-free milk," which is actually only 77%-99% free of lactose! Regardless of lactose-intolerance, a lot of health-conscious adults have started considering soy milk over milk for its purported health benefits. Also, since it is extracted from soy and does not involve animals in its production, it is a very strong preference for vegans. Cow’s milk is an excellent source of calcium, vitamin A and vitamin D, which is essential for strong bones. It also contains casein and whey protein which is good for building muscle. Soy milk has more vitamin B and iron than cow's milk. It also contains 42 times more manganese, which is needed for bone formation. Soy protein reduces LDL cholesterol (“bad” cholesterol) and raises HDL cholesterol (“good” cholesterol). Soy milk also contains more fiber than cow’s milk, and isoflavones, which help prevent cancer, heart disease and osteoporosis. In general, soy milk contains less fat, sugar and calories, and more iron and fiber than cow's milk. Lactose, the sugar found only in milk is the primary cause why milk may not work for lactose-intolerant people. While it may be the best nutrition for infants and little children, many adults look for alternatives because of its higher fat content and the gassy, bloated feeling it can give as it is slightly more difficult to digest. Moreover, many consumers are concerned about the presence of bovine growth hormone often found in industrialized, non-organic milk - however, this hormone is a synthetic hormone and there are several places where you can find natural milk free of any synthetic modifications. Soy milk contains a high percentage of phytoestrogens, which may decrease fertility in men if they consume more than 3 quarts per day. Too much estrogen can also cause a hormone imbalance in women when consumed too much and too frequently. Soy milk also contains oligosaccharides, a type of carbohydrate the body has difficulty breaking down. Consuming these simple sugars can cause some people to experience a lot of gas. Soy milk also contains substances called phytates, which interfere with calcium absorption. India is the world’s largest producer and consumer of milk, while Zealand (not New Zealand! ), the EU, Australia and the US are the world’s largest exporters of milk. China and Russia are the largest importers. Soy milk originated in China. It is popular in Malaysia and other South Asian countries. It is also becoming more popular in India, and its popularity in the West is growing, due in part to increasing numbers of vegans and vegetarians. This is outdated Soymilk today has more calcium and has the vitamin you need to digest such amounts.